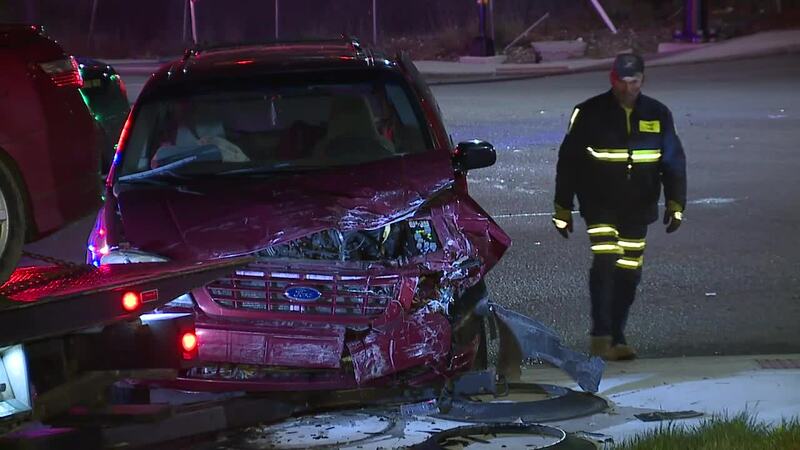 An Akron man was arrested Wednesday morning after he allegedly violated a protection order and colliding head-on with another car, which sent two people to a hospital, according to the police report. Dorshawn Fleetwood, 35, of Akron, was charged with burglary, aggravated vehicular assault, violation of a protection order, unlawful restraint and OVI, Akron police confirmed. At around 1:00 a.m., police responded to the 400 block of Stanton Avenue in Akron after a 12-year-old boy was told to call police by his mother when her boyfriend, who she had a restraining order against, came inside her home. The mother left with Fleetwood before police arrived because she feared for her child's safety, according to the police report. While driving on Stanton Avenue, police saw a red van driving at a high rate of speed past the house. From inside the van, the woman called the police to tell them she had a fight with her ex-boyfriend, the report said. Police said Fleetwood allegedly accelerated away towards the intersection of South Main Street and East Miller Avenue where the light had turned red, the report said. When the woman asked the boyfriend to stop, he said he was going to kill them both, the report stated. When Fleetwood approached the intersection, he crashed into a Toyota Camry, according to the report. The driver in the Camry and the woman inside the van with Fleetwood were taken to Cleveland Clinic Akron General with nonlife-threatening injuries. Fleetwood was treated at the scene before he was placed under arrest and taken to Summit County Jail.